Run, Gophers, Run. Find your holes. The Gophers are coming! The Gophers are coming! They’re running all over the place. We hope the mighty Nittany Lions can chase them back down their gopher holes. Minnesota is coming off a big 31-24 win over Colorado State (2-2), while Penn State is still reeling from a 49-10 loss to #4 Michigan (4-0). This game is the conference opener for the Golden Gophers, who will be playing at St. Joe Memorial Stadium at Beaver for the seventh time. Penn State leads the series 8-5, including a 4-2 record at home. While we’re warming up for the season — Saturday can’t come soon enough! — I’ll stop and take note of one more embarrassing Big Ten high-profile resignation. 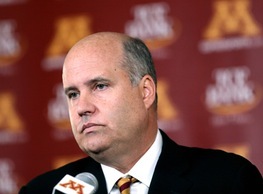 University of Minnesota Athletic Director Norwood Teague, 49, resigned as a result of a drunken sexting scandal involving coworkers. Penn State doesn’t play Minnesota this year, so our girls are doubly safe.